By now, your long runs are getting longer. Depending on your training plan, your longest training run may be 12-14 miles. It’s time to start practicing for your half marathon. You should use the rest of your long runs (or at least two of them) as rehearsals for the race. Meals. Dinner the night before and your morning pre-run food should be exactly what you plan to eat before your race to make sure it will not upset your stomach and/or cause unplanned bathroom visits. You also want to make sure the meals fuel your muscles sufficiently for the long run effort with a balanced mix of carbohydrates, protein and healthy fats. Hydration. Similarly, your fluid intake the day before and morning of your run should mimic your race day hydration. As a general rule for race day (and long run practice days), two hours before the run, drink between 17 and 20 ounces of water. About 10 minutes before you head out to run, drink another 10 to 12 ounces. Fueling and hydration during the long run. Here again, mimic the quantities and frequencies of fueling and hydration that you will use on race day. Pay attention to the location of the water stops in your goal race and the type and location of nutrition (sports drinks, gels, etc.) that will be provided during your race. This information should be on the race website and on the course map. Practice with the specific brands of nutrition prior to the race to make sure they agree with your stomach. 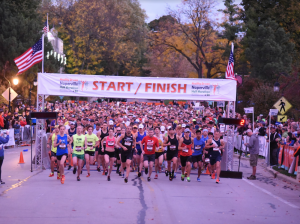 The Naperville Half Marathon serves water and Gatorade Endurance Formula, and will have six hydration stations at approximately every two miles (they are marked on the course map). Attire. For long runs, you should wear the exact outfit you plan to wear during the race – shorts/tights, tops/jog bras, socks, shoes, hat/headband and hydration belt/pack (if you are using one in the race). I recommend using a fairly new (but broken in) pair of shoes for the half marathon. A common strategy is to wear a new pair of shoes for one or two of your shorter mid-week runs, then use them for one of your longest runs (10 miles or more) and then wear them for the half marathon. This will give you shoes that are broken in but still with plenty of cushion and life. Make sure you practice with all of the clothing to ensure you know how to combat chafing and blisters with your chosen outfit. Terrain. Mimic terrain/running surface, elevation changes, climate/temperature and time of day of the race for your long runs. If possible, run part or all of your long run on the actual race course (traffic permitting of course). Pacing. If you are going for a specific goal time for the half marathon (if it is your first half marathon, you should not have a goal time and instead focus on finishing) practice your race pace for parts of at least some of your longer runs. Also, practice even or negative splits (running the second half of the long run faster than the first half.) This type of pacing will help you to maximize your performance and not burn your glycogen reserves too early in the run. Remember, practicing these elements of your race during your final long runs will help you to find the best strategies for you and reduce your race-day anxiety by ensuring you feel as prepared as possible.